On July 25th, the baby of our family, Avonlea, turned 4 years old. 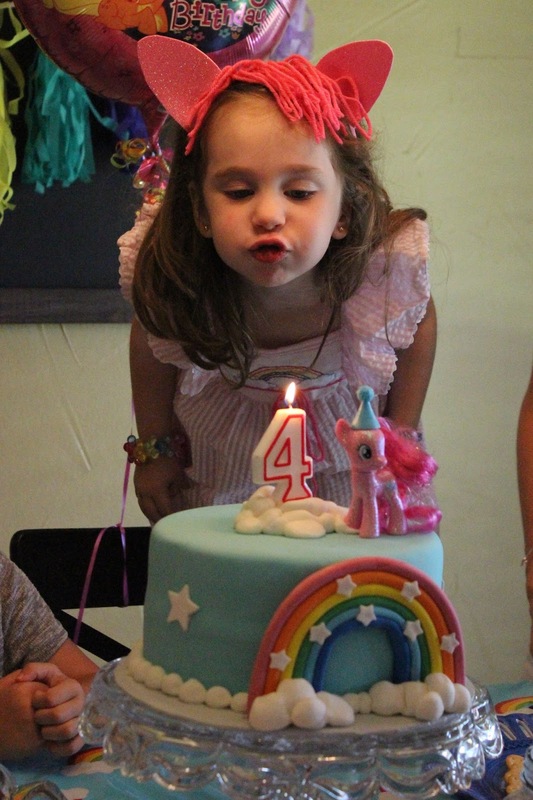 To celebrate, we invited four little girls over for a "My Little Pony" themed birthday party. Avonlea's favorite toys these days are her "My Little Ponies" so this was a very meaningful fun theme for all of us. Of course, it was even more special since I loved "My Little Pony" when I was a little girl back in the 1980's. Avonlea was SO excited for her birthday this year. 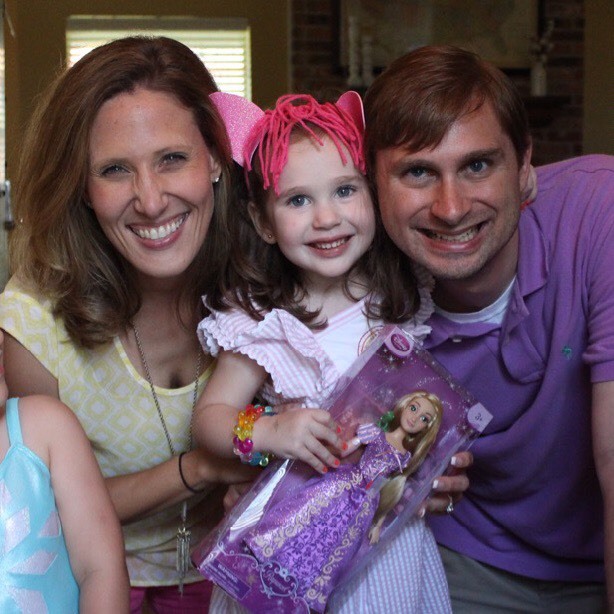 She loved every part of the party-theme and party-planning process and getting to host her friends. Because pretend play is always fun when you're four, I made each of the girls little felt pony ears and pony tails to wear. Each child was a different pony. Avonlea's favorite pony is "Pinkie Pie" (pink). But we also had "Twilight Sparkle" (purple), "Rainbow Dash" (rainbow), "Rarity" (dark purple+light purple) and "Apple Jack" (yellow). The first activity that the girls enjoyed at the party was stringing Pony Beads together to make friendship bracelets. I was surprised by how long this activity kept the girls' attention. They seemed to really loved this. Aunt Brooklyn helped a few of them get started. After making friendship bracelets, we played a version of "Pin the Tail on the Donkey" but played "Stick the Cutie Mark on the Pinkie Pie." "Cutie marks" are the little graphics that each of the "My Little Ponies" wear on their back legs. It's hard to believe our tiny tot is now 4. Avonlea is full of sugar and spice and everything nice. She loves pink, twirling in dresses and playing with dolls. She also loves dress up, princesses, singing and dancing. She is very independent, inquisitive and articulate. She calls her brothers "my boys." Bennett is her everyday playmate. Oliver is her always protector. She loved blowing out her candle! 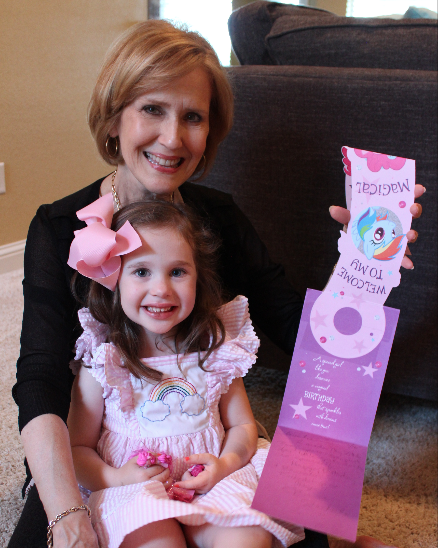 Avonlea received so many fun gifts for her birthday. But one of the sweetest gifts I can't help but mention is one given to her on behalf of my mother's dear friend. (Pictured: Avonlea in the lap of my mom and her grandmother, affectionately called "Mumsy," holding the gift). My mom's friend, Christina ("Critty") Fairback, recently heard that Avonlea was having a "My Little Pony" themed birthday. 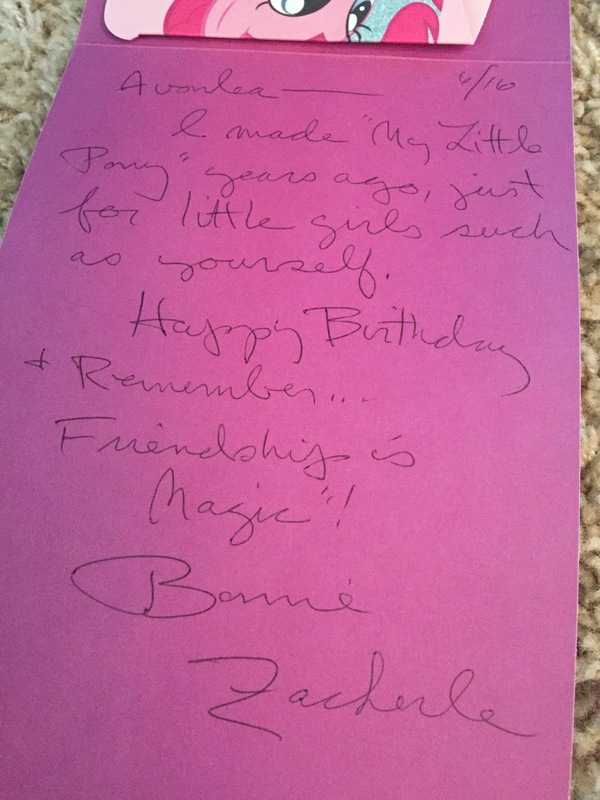 So, being friends with the "My Little Pony" creator, Critty decided to purchase a card and ask her friend, Bonnie, to sign it in order to send to Avonlea. "Avonlea, I made "My Little Pony" years ago, just for little girls such as yourself. Happy Birthday and Remember...Friendship is Magic! -Bonnie Zacherele." This card is SUCH a treasure to Avonlea and, frankly, to our whole family (who, at this point, are all fans of the toys/show). What a sweet lady Bonnie is for doing this for Avonlea and what a sweet friend Critty is to ask Bonnie to do this for her. It's hard to believe that an idea that came from the imagination and heart from a woman's own love for horses could become such a sustainable and well-loved toy that brings such joy to little girls like Avonlea 30 years later. Thank you, Bonnie and Critty, for such a very meaningful gift that we are sure to always keep!!! Avonlea, we are thankful for the gift God gave us in you! We've loved every one of your 4 trips around the sun! Can't wait for many more!